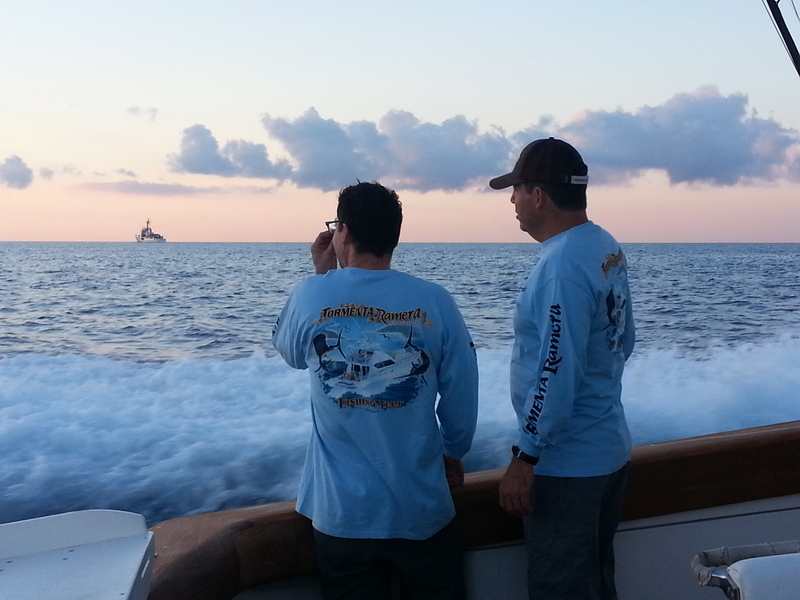 Patrick and John Hemingway depart Key West for Havana in the early morning of Friday, May 22; USCG cutter in the distance. Photo courtesy of Jeffrey Boutwell. Click here for a full photo album of the fishing tournament trip. As part of LAWGEF’s U.S.-Cuba Hemingway Commemorative Project, Ms. Mavis Anderson (Senior Associate, Latin America Working Group Education Fund–LAWGEF) and Dr. Jeffrey Boutwell (LAWGEF Board Member and Secretary, US Pugwash) helped secure approval for U.S. sport fishing boats to travel legally to Cuba in May 2015. Over three days, from May 21-23, history was made as the first U.S. sport fishing boats in 35 years legally sailed from Key West to Havana to participate in the 65th Ernest Hemingway International Billfish Tournament, hosted by the Hemingway International Yacht Club in Havana, Cuba. Two Hemingway grandsons, John and Patrick, sailed with M/V Tormenta Ramera, a Viking 64 sport fisher owned and captained by Tim Gipe of North Miami, FL. Departing the Safe Harbour Marina on Stock Island in Key West at about 6:30 AM on Friday, May 22, Tormenta Ramera crossed the Florida Straits in about 7 hours, with John and Patrick catching several dolphin fish (dorado) along the way. The boat arrived at Hemingway Marina at about 1:30 in the afternoon, greeted by Hemingway Yacht Club Commodore Jose Miguel Diaz Escrich, members of the international press, and a sizeable crowd of tournament enthusiasts. Other U.S. sport fishing boats that, with the help of LAWGEF board member Jeffrey Boutwell, obtained the necessary U.S. Commerce and Treasury licenses and US Coast Guard permits to enter Cuban territorial seas, arrived Friday afternoon and through the weekend. He and LAWGEF Senior Associate Mavis Anderson had been working since the fall of 2014 with Anthony Zamora and Bruce Kessler of the Florida-Cuba Environmental Coalition to assemble a group of U.S. boats to apply for and receive the necessary U.S. government permissions to travel to Cuba. By the early spring of 2015, the application process was well underway, and in consultation with the U.S. State Department and key Members of Congress, LAWGEF was able to secure the necessary approvals to allow a total of eight U.S. owned sport fishing boats to sail from Key West, Florida to the Marina Hemingway in Havana to participate in the tournament. One of these, Therapy 2, a Hatteras 50C owned by Kurt Winters and Bob Zimmerman and captained by Kurt Winters, was the boat from which John and Patrick fished on the first official day of the tournament, Tuesday, May 26, accompanied by CBS news correspondent Dean Reynolds and camera crew. The CBS story on the Hemingway tournament and how the presence of U.S. boats marks a new phase in US-Cuba relations aired on the CBS Evening News on Thursday, May 28. U.S. participation in the tournament also helps advance the conservation of important shared ocean resources in the Florida Straits between the two countries. As is well known, highly migratory species such as marlin, swordfish and Atlantic tuna depend upon healthy eco-systems along the coasts of both Cuba and the United States for adequate spawning grounds and marine environments in which they can mature. Yet, because of strained political relations between the U.S. and Cuba for more than half a century, our knowledge of the populations of marlin and other billfish is woefully inadequate, to say nothing of their breeding and migration patterns and overall health. Accordingly, as a well-established international sporting event, the Hemingway Tournament can have positive environmental implications for Florida and the entire Gulf coast of the United States in fostering closer collaboration between the sport fishing and ocean resource communities in both countries. This is especially true as the Hemingway International Billfish Tournament is a ‘catch and release’ competition (and as such is sanctioned by the International Game Fish Association, headquartered in Ft. Lauderdale, FL), and U.S. participants will be advocating for the use of ‘circle hooks’ by all participants so as to improve the survival rate of sport fish that are caught and released. As many as 25 international sport fishing teams competed in the Hemingway tournament through the remainder of the week, concluding on Saturday, May 30 with the final day of fishing and awards ceremony that evening at the Marina’s Hotel Acuario. Over four days of fishing, participants caught (and released) 40 blue marlin, 12 white marlin, and assorted sailfish and dolphin fish (dorado). On their return trip to Key West on Sunday, May 31, John and Patrick Hemingway traveled on Therapy 2 and were joined by Washington Post reporter Nick Miroff. Other U.S. boats in the LAWGEF group traveling to Key West included Blue Heron, Imagine, Key Player, Ranger and The Good Life, and all were boisterously welcomed by Key West boaters and fishermen who have been waiting three and-a-half decades to once again sail legally across the 90+ nautical miles of the Florida Straits to Cuba, as Ernest Hemingway so often did from the 1930s through the 1950s. Click here to learn more about the U.S.-Cuba Hemingway Commemorative Project. Click here for a full photo album of the September 2014 trip. On Saturday, June 6 the Washington Post published a front-page story about the Hemingway International Billfish Tournament, but with no mention of LAWGEF itself and no context of the important role it secured in obtaining the Commerce and Treasury licenses, and USCG permits, that allowed the eight U.S. sport fishing boats to travel from Key West to Havana to participate in the tournament. Unfortunately, the article also only quoted one participant’s experience of the tournament, failing to convey the overall positive experience that the vast majority of American fishermen had while competing in the tournament. Below is a letter to the editor of the Washington Post that I wrote to give a more accurate picture of U.S. involvement in the tournament. The Letters to the Editor section of the Post responded that they were considering publishing the letter, but thus far it has not run. I coordinated obtaining U.S. government licenses and permits for a group of eight U.S. sport fishing boats to participate in the 65th Hemingway International Billfish Tournament in Cuba from May 25-30. This was the first time in 35 years that U.S. boats legally sailed to Cuba for the Hemingway tournament, and yes, there were instances of misbehavior by some Cuban customs agents upon entering and leaving the Marina Hemingway in Havana, as reported in the June 6 front-page article “In Hemingway’s restless waters.” We are making our concern about this behavior known and expect it will be corrected in the future. More than 50 Americans were on these boats fishing in the tournament (most agreeing with one boat owner that it was “the greatest fishing trip my team has ever experienced”), and they very much look forward to fishing again in Cuban waters. The writer is a member of the board of the Latin America Working Group Education Fund.